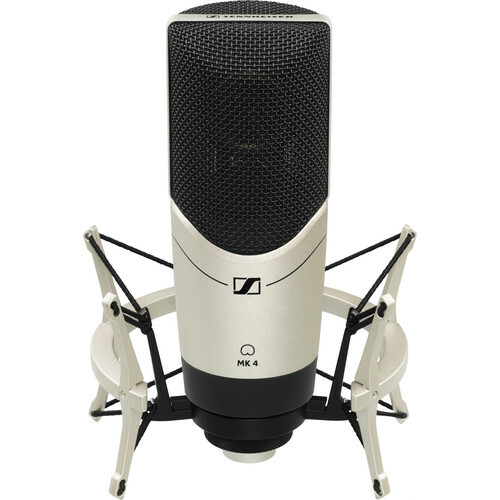 The MK 4 Studio Condenser Microphone with Elastic Shockmount from Sennheiser is a bundle containing the MK 4 Microphone and elastic shockmount. The MK 4 is a condenser microphone for home studio engineers, production studios, sound reinforcement and more. The MK 4 features a large-diaphragm 1" transducer for a full sound, wide-frequency response, and low noise. The element is shock mounted to eliminate structure borne noise and vibration. Its sensitivity and frequency response make it well suited for general vocal recording, instruments, amplifier cabinets, and more. Box Dimensions (LxWxH) 15.1 x 8.0 x 7.0"
MK 4 Studio Condenser Microphone with Elastic Shockmount is rated 5.0 out of 5 by 1. Rated 5 out of 5 by Richard from Excellent Mic Very detailed and precise, but not cold or harsh. I use this for voice-over work (character & narration), and it really delivers. An excellent mic, very sensitive and articulate. Made in Germany in the same factory as Neumann mics (Sennheiser owns Neumann), so you know it's quality, and it sounds like it.